I’ll assume that you’ve watched the first season so I won’t bother too much on going over how great this series is and trying to persuade you to watch the rest. If you haven’t watched the first season and you’re just skimming through the series’ reviews, let me just say that you don’t need to love baseball to love this anime. In fact, I didn’t even understand baseball before I started watching Major. It did make it a little difficult to follow due to all the baseball terminology, but I spent just fifteen minutes online reading up on the rules and I was good to go! Major: Yuujou no Ikkyuu is the first and only movie in the Major series and is best watched after finishing the first season. It can be classified as a filler since the main details are recapped in the first episode of the second season but it’s highly recommended to be watched before moving on to the next season. The MAL (source: ANN) synopsis had me confused at first too. A “triumphant campaign in the US”?! When did that ever happen? Just to clear things up, this story is told in retrospect by the Goro from the end of season four. It’s a flashback of the events that occurred after he left his hometown and the reason as to why he changes his pitching style. Despite its low rating (relative to the other Major titles), I really enjoyed this movie. Although it has a typical “Goro” storyline, his determination and perseverance really shows no matter how many times you’ve seen it before. This is actually my first review on MAL so far. I know that it’s pretty short, but I’d prefer not to go with the Art/Sound/Story/Enjoyment/Character rating that most reviewers go with. I mainly wrote this up to clear any confusion that anyone would have regarding the order in which to watch the titles in this series. I’m open to feedback, but please don’t be too harsh! Major the Ball of Friendship tells the story of the events that occur between season one and season two however, it takes place after Major S4 at the beginning and end although the majority of the movie is the flashback. That being said if you watch it after season 1 there are some minor spoilers that are shown about Goro's advancement in his baseball career but nothing major that ruins the series so it's your call on whether you want to watch it after S1 or S4. I find that a lot of people that have seen the Major series have not seen this movie which is a shame because the quality of the movie stays consistent compared to the rest. - A very hype series of games! Overall it was a very enjoyable watch which is expected because it's Major. This movie is heavily underwatched around here so if you haven't already seen it and have watched the rest of the series, what the hell are you doing, go and watch it! To start, yes you probably have to be a baseball lover to completely enjoy this movie as much as I did, i wont say you can hate baseball and you will still give it a 9 or a 10. Now Ill say that this was one great baseball movie! The characters pretty much all balanced each other out like they should for a good baseball team to work well together. 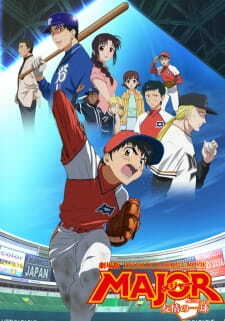 The main character is a guy who is highly skilled in baseball and loves baseball with all his heart. His goal isnt to be the best player on the team, its to help his team members get better so they can all enjoy winning together. In movies its hard to tell a lot cuz you can ruin it but, Ill tell you the main character goes through some hard decisions on whether hes risking his future baseball career or not helping his team like he wants. This struggle just shows how much he cares for his team. I recommend people definitely watch this if they love baseball, but also those that like movies or shows about how strong and how important friendship is to people. Poll: Do I need to watch this?